ChoiceShirts had a makeover yesterday and the site looks great. It’s previous appearance was good but really had the appearance of a stereotypical t-shirt shop that was limited to licensed t-shirt designs. The new site has a very pleasant and clean appearance and the reduction of a zillion categories that used to run wayyy down the page has been removed and exchanged with what they call “individualized stores” to better help customers find what they are looking for. Everything about the site has been updated including the custom t-shirt designer. Other features including the ability narrow your search by style, size or category have been added. The Checkout process has also been improved. We have some images to highlight a few of the changes. 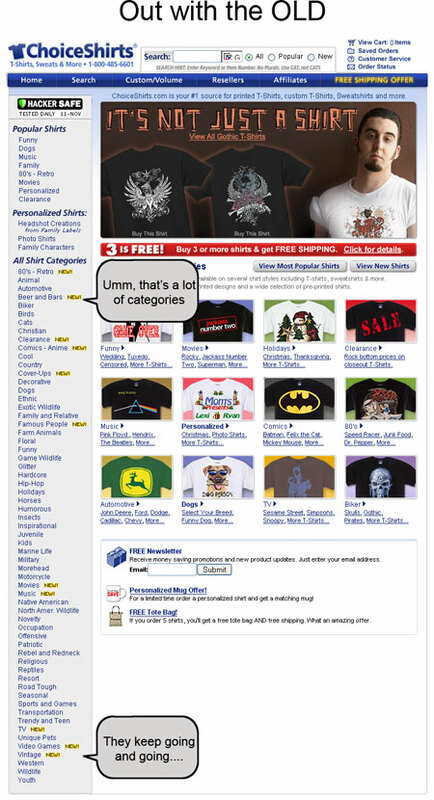 First, check out what ChoiceShirts.com looked like before below. As you can see the categories drag along the page making it not the easiest to navigate or find what you are looking for (also, for the record this is not the most recent screenshot of the site from before the last update, its many months old). On the the new! 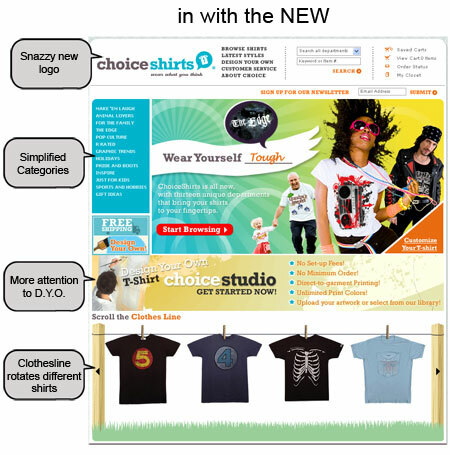 ChoiceShirts has a new logo, simplified categories, more attention to the design your own t-shirt features of the site and a novelty clothes line that shows you different shirts when you mouse over the edges of the clothes line. There were also major updates to the categories. They were reduced, simplified and really given a more customized look. 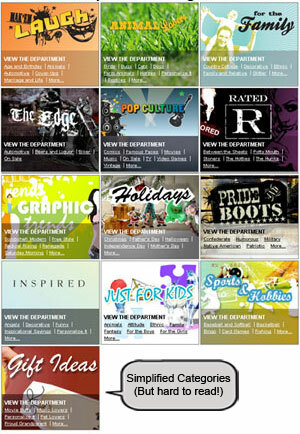 The main category page is bright and exciting but isn’t necessarily clear and simplified like the rest of their site. I personally found it difficult to read links that were put on top of photographs/images. 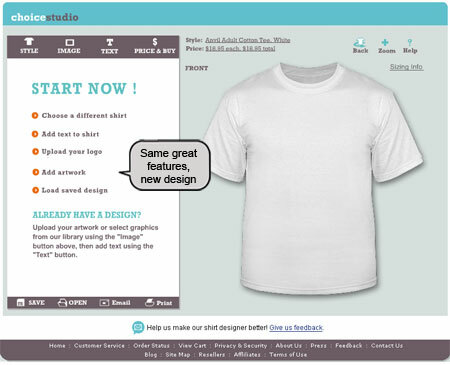 Lastly, the T-shirt product design was given an update to match the site. I didn’t see any new features but I could have missed them. It really doesn’t matter if they updated because they already have one of the best t-shirt designers out there today. The new skin is really does simplify the designer which is a good thing. I love the new look! It’s always nice to see a fresh new look.